Has any one looked cooler? The great man has become a dad as Jono said and he is also going strong having taken the first two wickets of the Lankan inning. A living legend, if ever there was one. Very true. This should be pinned for all of us AA fans. Damn right. AA jnr or Mini-AA, however you want to say it, is going to be really proud of his father when Ajit calls it a day. I wonder if AA's son will have ears like his dad. Ah, The one who scored 7 test match ducks in a row against Australia? Indeed. AA is truly an icon of Cricket Web. This HAS to be stickied. He scored some runs after the first five ducks against unimportant opposition. Then when the Aussies were oposite him again, he did it again twice. Only in the last game, the first in India against the Aussies that he let up a bit and scored 15 and 44 no. Last edited by SJS; 03-11-2005 at 01:39 AM. It is a sign of the true genius of the man that he can put such minor setbacks behind him, and come back with sensational performances such as today's. 5 wickets, a catch, a run-out. No doubt the esteemed Indian upper order will wilt in the face of fearsome Murali pressure and AA will get to bat too. In all seriousness, I wonder what the great AA was thinking when he had that streak of ducks. I mean what do you say? "Damn... at least I'm consistent"
That kind of a run from someone who isnt a total wreck with the bat has to do a bit with dastardly bad luck. Later as it started piling up it would have affected him mentally. What with crowds chanting Bombay Duck or whatever they did. It must have been terrible and though a genius, our Ajit is human after all...or is he ? Nooo pleaeaease uncle Nostradamus NO !!!! our Ajit is human after all...or is he ? If he isn't, it's worth bearing in mind that he has just become a father. Did anyone ever see that film starring Julie Christie - "The Demon Seed"? Personally I think he was just a victim of what we call the opposite. I remember looking at his face after the commentators were pretty much mocking him over here in Aus (obviously they were at the time unaware of AA's greatness ) and just thinking "You poor bugger." The big ears may be a sign. 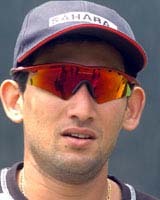 AAAS wishes Ajit Agarkar a very happy birthday!